ThirstyAffiliates Review: Is It The Best Affiliate Link Cloaker? If you’re an affiliate marketer, you know how difficult it is to get commissions and make sales. Affiliate marketing is not easy as many people mention it. Creating an affiliate income from your website requires effort. Apart from this, promoting products on your website has its own hurdles. One of the biggest hurdles is optimizing your website for affiliate marketing. This mainly involves optimizing your affiliate links. Adding an affiliate link on your website doesn’t mean optimizing affiliate links. You also have to keep track of your links and get stats of your performance, and making your affiliate links look clean. This can be done by link cloaking plugins for WordPress. Such plugins cloak long unattractive links and replace them with your brand URLs. Using cloaking links helps you provide a clean looking URL to your visitors which improves your affiliate sales. On top of this, using a cloaking WordPress plugin can help you track the stats of all your affiliate links in one place. Today, I’ll be doing a detailed review of an affiliate link management plugin named ThirstyAffiliates. Conclusion: Is It The Best Affiliate Link Management Plugin? ThirstyAffiliates is an affiliate link management plugin for WordPress that gives you full control over your affiliate links. You can create affiliate links for your products and manage them easily with the features available in the plugin. ThirstyAffiliates is a free plugin but there are many extra features available in the pro version. You can download the plugin directly from the WordPress repository or get the pro version. Go to the plugins page in WordPress and add a new plugin. Now, search for ThirstyAffiliates plugin and install and activate it. If you want to go for the Pro version, you can buy and download it from their website. After installing and activating the plugin, it’s time to create your first affiliate link using ThirstyAffiliates. After the plugin is activated, you’ll see a menu for ThirstyAffiliates plugin in your WordPress dashboard. Hover on the menu and click on ‘New Affiliate Link’. Add the name of the product for which you’re creating an affiliate link. The name of the link should be simple and small. It’s because this is the field that will be displayed in your newly created affiliate link. This is the URL of the page where the user will land when they click on your cloaked affiliate link. Here, you will have to include the affiliate link to the product page. If you want to display your affiliate link in your pages and posts, this option isn’t that important for you. But if you want to display your link as a widget in your sidebar, you can attach an image. By doing so, the attached image will be displayed each time the product is mentioned in your content. Though this option isn’t of much use when you’re creating a new link. But it can save you a lot of time once you’ve created the link and want to edit it. What this option does is that it scans and displays the pages and posts where that specific link is included. 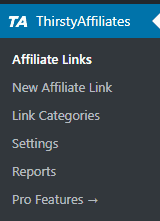 On the sidebar of the new affiliate link page, there is a tab that contains several link options. No Follow Link: You can turn this option on if you want to nofollow your affiliate links. By doing so, it will automatically add a rel=”nofollow” tag to your affiliate link. So whenever you add this specific link to your content, it will contain the nofollow tag. Open this link in new window: I recommend turning this option on to save your time. Your affiliate link should open in a new window and enabling this option while creating your new affiliate link will save you a lot of time. 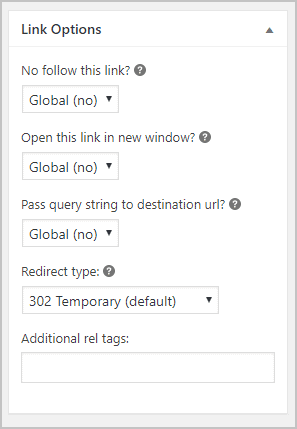 Pass query string to destination URL: If you want to pass on extra bits of information in your cloaked affiliate link, you can enable this option. This option comes in handy if your affiliate program allows extra tracking tools. Redirect Type: You can set different types of redirects for your URL. Additional rel tags: This text field allows you to add extra rel tags in your link. So that’s how you create an affiliate link in ThirstyAffiliates. Simple, isn’t it? If adding links is so easy in ThirstyAffiliates, how easy would it be to add links to your content? I’m glad you asked. Because that’s what I’m going to show you next. Adding affiliate links in your content is very simple using ThirstyAffiliates. The plugin allows you to add an affiliate directly to the WordPress page/post editor. And if you haven’t created a link, ThirstyAffiliates also gives you the option to create a new affiliate link directly in the WordPress editor. Once you’re in your WordPress page/post editor, you can see two new buttons on the menu. The first button allows you to add an affiliate link to your content. Click on the button and select the affiliate link you want to add. 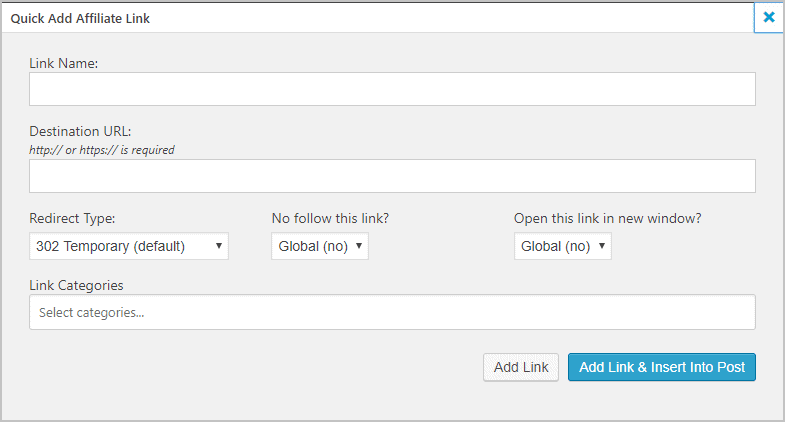 The second button allows you to create a new affiliate link directly in your editor. Clicking on it will open a pop-up where you can enter the details of the affiliate link. It’s exactly the same process to create a new affiliate link here. But since you’re creating a new link directly in the editor, ThirstyAffiliates gives the option to create the link and insert into post. The purpose of an affiliate link management plugin is not just creating affiliate links. It should provide features required to manage those links. And ThirstyAffiliates really excels at doing this. They make managing affiliate links very smooth. Let’s dig into that. ThirstyAffiliates makes managing all affiliate links from one place quite simple. 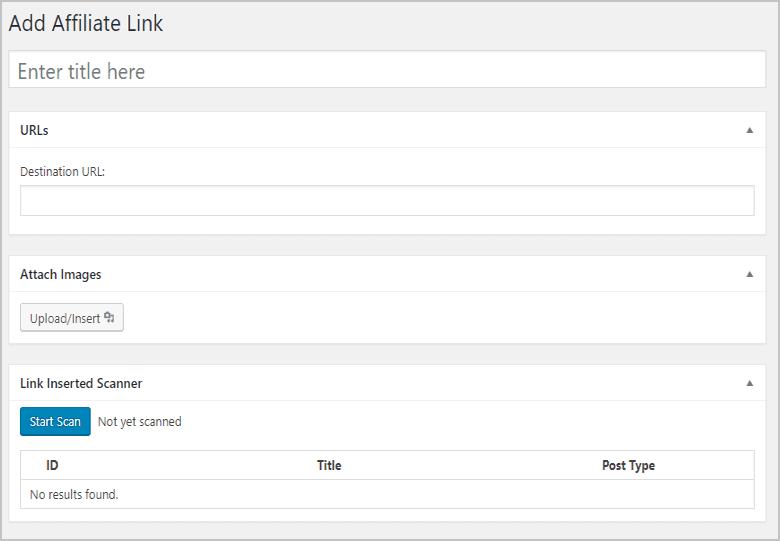 To manage your links, go to the Affiliate Links dashboard of the plugin. The Affiliate Links page displays all the affiliate links you have created. It displays the Name, link ID, redirect type, cloaked URL, destination URL, and link category. You can directly copy the URLs from this page. You can also edit these links. And if you want to add a new link right from this page, you can click at the button on the top to create a new link and it’ll redirect you to the new affiliate link page. That’s how simple it is to manage all your affiliate links from one place in ThirstyAffiliates. The features we discussed above are available for free on ThirstyAffiliates. The pro version of ThirstyAffiliates comes with even more features. Here’s what you get in the pro version. The free version of ThirstyAffiliates is itself a great plugin for link cloaking and managing affiliate links. But the pro version takes you to a new level. With features like automatic keyword linking, geolocation redirects, and link scheduling, one can only imagine how awesome ThirstyAffiliates Pro is. Let’s skip the chit-chat and get down to the nitty-gritty. The first feature that I love the most is automatic keyword linking. This nifty little feature automates the linking process and saves you a ton of time. Instead of manually adding affiliate links in your posts, the automatic keyword linking feature allows you to specify a set of keywords for a each link. So, whenever these keywords occur in your content, the auto-linker feature will add that specific link to the keyword. For example - If you are an affiliate for StudioPress and you want to add your link for terms like ‘best WordPress themes’, ‘buy WordPress themes’ etc, you can specify a set of terms and the auto-linker will automatically add your link to these terms. It’s a time saver and if you want to become a good affiliate, this feature will help you a lot. How do you know that your affiliate links are performing well? Well, this question can be answered with the help of ThirstyAffiliates advanced statistic reports feature. You can get reports and stats of the performance of your links. It also allows you to sort stats by category or different time periods. You can also get advanced geolocation reports that help a lot if you’re targeting different countries. On top of this, you can save your own custom reports that can be used for viewing your performance statistics easily. This is a must-have feature if you’re targeting audience from different parts of the world. Because not all affiliate programs support same URLs for different countries. With geolocation link redirects, you can redirect them to different destination URL based on their location. This is very helpful for Amazon affiliates who target multiple countries. Another great feature if you’re an Amazon affiliate. Amazon API importing feature allows you to search and import affiliate links from Amazon’s product advertising API. So instead of searching for products and creating their affiliate links, you can directly search for products and their affiliate links in ThirstyAffiliates. You can import or export affiliate links using the CSV import/export tool. If you are managing links on multiple websites, you can directly import or export links using this tool. ThirstyAffiliates provides advanced statistics but that’s not it. You can also export data as CSV which can then be imported into Excel or Google Sheets to further manipulate data. This is an underused feature and many power affiliates use it to make more sales. Link scheduling allows you to specify when an affiliate link should be active. So, if your affiliate program has a limited discount campaign coming up, you can create a new affiliate link and schedule the link for the time period of the campaign. ThirstyAffiliates Pro also allows you to specify when to stop link scheduling and where visitors should go before and after scheduling. If you know the importance of analyzing your performance stats using Google Analytics, you’ll understand how great this feature is. Whenever an affiliate link is clicked, a click event will be pushed in Google Analytics. Google Analytics will trigger the event no matter where the link is clicked on your website. This helps in faster redirects. It will load the link into htaccess which makes affiliate link redirects very fast. Feels good when your affiliate links are clicked, right? Well, you can set up notification emails when certain milestones are achieved. These milestones can be anything like 1000 affiliate link clicks or100 clicks to a specific link in under 24 hours. I’m sure you don’t want broken links on your website. ThirstyAffiliates does its best when it comes to checking the health of affiliate links. It checks the health of links automatically and notifies immediately if an error is found. This helps in resolving link errors fast and of course, you can sleep peacefully at night knowing that you’re not losing your affiliate income. Don’t want to share cloaked links on social media? You can shorten your links using goo.gl ad bit.ly directly in the plugin. If you’re using Google Tag Manager, then you can push an event click in Google Analytics with this feature. Ability to Shorten Links Within the Plugin. Amazon API Support for Easy Affiliate Link Creation. Advanced Reports With CSV Export. No integration with WooCommerce & Easy Digital Downloads. If you haven’t used an affiliate link management plugin before and think that you would run into some problems using ThirstyAffiliates, don’t worry. The support team is very responsive and will help you solve your problems very fast. Not only this, the documentation of the plugin is quite extensive and will help you use the plugin easily. ThirstyAffiliates also have a knowledge base where you can find answers to most of your questions and problems. ThirstyAffiliates is a free plugin but as mentioned above, the pro version comes with many useful features that will help you increase your affiliate income. Let’s discuss the pricing of the ThirstyAffiliates. Before moving to pricing, let's see the features of free and premium version. No Follow & Open In New Tab Option. Exclude Known Bots From Statistics. WPML & Polylang Translation Plugin Integrations. Google Analytics Click Event Pushing. The pro version comes at different prices based on the number of sites you can use the plugin on. The single site license is priced at $49 which is very affordable for an affiliate link management plugin. With the features provided, I think this is a good deal for affiliate marketers. Unlike other plugins, you will not have to look for other plugins that serve a particular purpose. ThirstyAffiliates comes with all the features need to fully run your affiliate marketing website. Apart from the single site license, the plugin also comes at $79 and $149 for 5 site and unlimited site license respectively. So if you want to use this plugin on multiple websites, you can go for the 5 site or unlimited site license based on your requirements. Use the following ThirstyAffiliates Coupon Code and get 15% discount on your total purchase. Get 15% OFF On ThirstyAffiliates Pro! Use this coupon code and get a 15% OFF on any ThirstyAffiliates Pro Plan. An affiliate marketer has to use many different tools to measure, analyze, and manage their affiliate business. And using these tools costs a lot of money. ThirstyAffiliates solves this exact problem by providing an all-in-one solution so you don’t have to look for plugins anymore. It’s a complete affiliate marketing suite for affiliates and by comparing it to other plugins, I can easily say that ThirstyAffiliates is one of the best affiliate link cloaker and management plugins. ThirstyAffiliates is the best link management WordPress plugin. 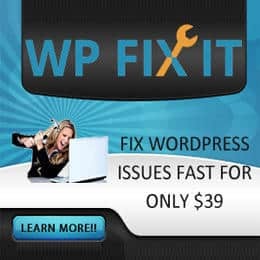 It's a must-have WordPress Plugin for every WordPress users. I’ve used several plugins for managing affiliate links and nothing comes close to Thirsty Affiliates. It’s easy to use and does what you want. Would definitely recommend to anyone who is into affiliate marketing. We Have A Discount Code For You! Use This Coupon Code & Get 15% Discount On ThirstyAffiliates Pro. Note: It's a limited time deal. So hurry up!